Last week’s events punctuated by the Trump administration’s cavalier abandonment of a century’s worth of American conservation practice is greatly discouraging. Interior Secretary Ryan Zinke wiped out more than 1 million acres of protected landscapes in two national monuments in southern Utah without even a semblance of public comment or environmental analysis. Be that as it may, we have abundant opportunities over the next month to make our voices heard on pressing land-management decisions that surround us. And despite the single-minded focus of the Trump administration on resource exploitation, there are many dedicated professional staff members toiling away in the Forest Service and Bureau of Land Management under difficult circumstances. Our national forest neighbors to the east and north are setting the course for the next 20 years. The Rio Grande National Forest is accepting public comments on its long-range management plan. People can weigh in with opinions about goals for the Wolf Creek Pass corridor, among others. You might suggest keeping intact Wolf Creek Ski Area’s mom-and-pop character and a focus on ensuring lynx and other wildlife can successfully move across Wolf Creek Pass rather than say, just for example, giving it away to a Texas billionaire for a fantastical real-estate development. The Rio Grande has also proposed some wilderness additions, including a significant expansion of the Sangre de Cristo Wilderness to include three fourteeners not currently within the wilderness. These include Kit Carson Peak, which was acquired through a big land purchase in recent years, and Blanca Peak and Little Bear Peak at the south end of the wilderness. The Uncompahgre National Forest to the north is at an earlier phase of revising its land-use plan and welcomes comment about the national forest’s baseline condition. One big change on the Uncompahgre since the last plan was completed in 1983 is the acquisition of thousands of acres of scattered mining claims on Red Mountain Pass and along U.S. Highway 550 from Idarado Mining Co. A question for the Uncompahgre is whether this changed land-ownership makes a greater conservation focus possible on places like the large massif of Hayden Mountain. Our BLM neighbors to the south are deciding whether to issue even more oil and gas leases near Chaco. Already, more than 91 percent of the land base managed by the Farmington BLM office is leased for oil and gas. Over the next month, the BLM will choose whether to lease another 4,500 acres. If you’ve traveled the U.S. Highway 550 corridor recently, you’ve undoubtedly seen the roaring gas flares lighting up the night sky or the enormous drilling pads around Nageezi and Counselor. While the BLM seems to be sticking with a 10-mile buffer around Chaco itself, Navajo residents of nearby communities don’t have any similar protections of their homes. There’s another opportunity to permanently safeguard some of our most cherished landscapes. Our congressional delegation is soliciting input about introducing the San Juan Mountains Wilderness Act that would add to the Mount Sneffels Wilderness and keep development out of Ice Lake Basin. The bill would not designate Ice Lake Basin as wilderness because of other uses, like heli-skiing, that conflict with wilderness, but it would make sure that Ice Lake is permanently off-limits to future mining and road building. That would guarantee this favored destination wouldn’t ever suffer a fate similar to much of the other high country in the Animas River headwaters. 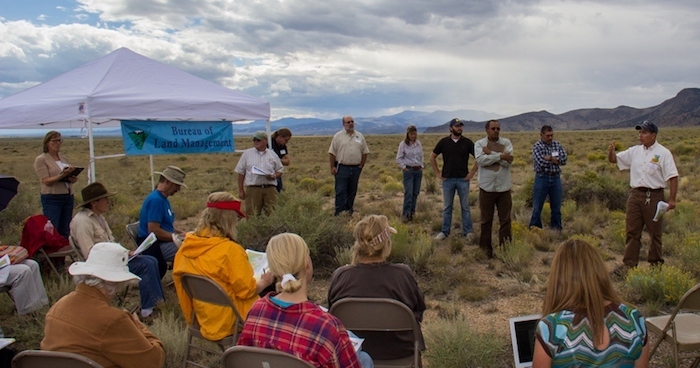 More information about these comment opportunities is available from several sources, including San Juan Citizens Alliance, High Country Conservation Advocates in Crested Butte and San Luis Valley Ecosystem Council in Alamosa.